The Chilkoot Trail Artist Residency is a creative journey through Klondike Gold Rush National Historic Park, Alaska and Chilkoot Trail National Historic Site, British Columbia. 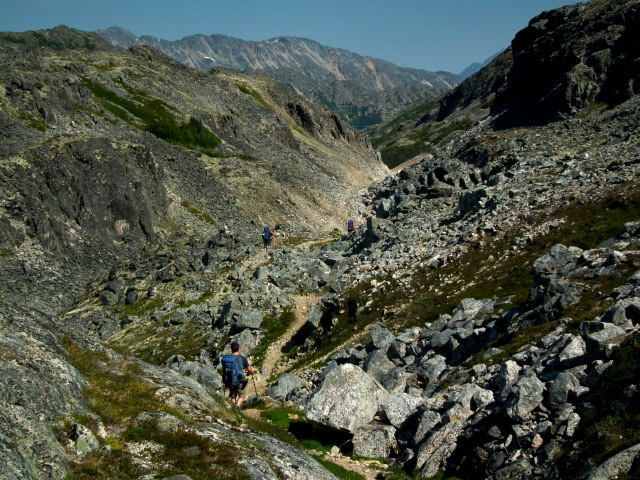 Each artist hikes the trail from Dyea, Alaska to Bennett in the Yukon Territory over a two week period, allowing time to work and savour the experience. The artists offer workshops at campgrounds and interact with other hikers along the way. Parks Canada partners with the Yukon Arts Centre, U.S. National Park Service, Alaska Geographic, and the Skagway Arts Council to facilitate this unique program. Florida State University Department of Art Faculty Kevin Curry’s work during this residency will involve using photogrammetry to “collect” artifacts and rocks from the trail to be reconstructed and adapted once back in my studio – a continuation of his exploration of how we collect experiences and assign emotions to memorabilia. He will also be creating 3D portraiture of hikers met along the way as a means of mapping the journey. For more information, please visit http://www.pc.gc.ca/eng/lhn-nhs/yt/chilkoot/natcul/5.aspx.